During our recent sampling trip to Flint on August 17-19, we collected samples to analyze for the presence of Opportunistic Pathogens (OPs). We reported previously that we did not find evidence to indicate that the OPs Legionella pneumophila, which may cause Legionnaire’s Disease, or Mycobacterium avium, were present in any of the samples we collected. During our trip, we collected samples from nine businesses located throughout the city of Flint, including eight of Flint’s designated monitoring sites and a business located in close proximity to the drinking water treatment plant, and seven homes of Flint water consumers. For comparison, we also collected water from four businesses that receive water from Detroit. At each of these sites, we collected both water samples and swabs of bacteria growing on the surface within the faucet, known as the biofilm. Here we report on our results for several additional OPs, alongside the previous results, based on presence of DNA markers specific to each bacterium. Pathogenic species are indicated in red. Mycobacterium spp. represents a genus of bacteria that includes several pathogenic and non-pathogenic species. Vermamoeba vermiformis is of interest because it is an amoeba that may play an important role in the life cycle of some pathogens, such as Legionella pneumophila. In addition, we attempted to culture pathogenic Staphylococcus species from the samples. Table 1 demonstrates that we did not detect quantifiable levels of Pseudomonas aeruginosa, Legionella pneumophila, or Mycobacterium avium in water or biofilm samples collected from any of the sixteen sites in Flint. Acanthamoeba polyphaga was found in the biofilm at 3 sites in Flint. Acanthamoeba polyphaga is an amoeba that is often associated with eye infections of individuals using tap water for contact lens care rather than sterile saline, but has also been associated with skin and respiratory infections. More information on this amoeba can be found here. Water from each site was also cultured using methods specific to growing Staphylococcus. Only two sites resulted in Staphylococcus growth. DNA from 10% of the resulting colonies were sequenced to identify the species. All sequences were identified to belong to either Staphylococcus epidermidis or Staphylococcus hominis. Both species are frequently found on the skin of healthy individuals and are not typically pathogenic. Figure 2: A method known as Sanger Sequencing was used to identify species of Staphylococcus based on unique patterns in the bacterium’s DNA. An example of the sequencing output is shown here. Each colored peak represents a fluorescent signal and corresponds to a different letter in the DNA sequence, which can be seen at the top of the display. Although the number of samples collected has been small and were collected from each site on a single date, our results do not indicate the presence of pathogenic OPs in Flint water, with the exception of sporadic detection of Acanthamoeba polyphaga in biofilm samples. Overall, this limited sampling, indicates that from a microbiological perspective Flint water does not seem to pose a health risk worse than many other U.S. cities that we have sampled. However, the chronically low chlorine residuals throughout the distribution system, suggest that this issue should be the subject of continued scrutiny. Additional Notes: The method we used to quantify the pathogens is called quantitative polymerase chain reaction (qPCR). It works by detecting DNA specific to the target microorganisms, making the method very specific, but also very sensitive, as an organism does not necessarily need to be alive or culturable for us to identify that it is present. The minimum threshold of target bacteria, or more accurately the bacteria’s DNA that must be present in the 1-liter samples that we collected is 10 DNA copies per mL or 104 copies in the entire swabbed biofilm. This is the best available and most sensitive method of OPs detection. Why did you only sequence the DNA from 10% of the colonies? To go a little more in depth about the process, we actually did an “enrichment” step before growing the Staphylococcus on agar. 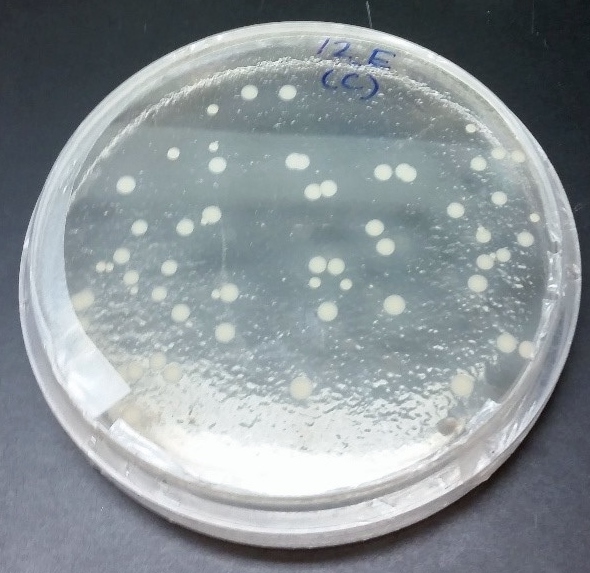 Plating bacteria directly onto agar from an environmental sample can sometimes be a bit of a shock to the cells and they don’t always grow. This has been documented to be the case for some Staphylococcus species, so we added the enrichment step, meaning we first grew cells from the Flint water samples in Staphylococcus-specific nutrient broth. We then plated the broth onto agar and isolated individual colonies from there. The result of this incubation in broth is that many cells will have resulted from each Staphylococcus cell that was present in our water sample. Therefore, it’s not feasible to sequence every possible isolate and it likely isn’t giving us any new information to sequence every single one. We did include some steps based on how the colonies look on agar and how they react with certain chemicals to screen the isolates so that we could have added certainty that the 10% of isolates we sequenced were capturing any variation we were seeing between the different isolates. For example, different species of Staphylococcus will result in different colored colonies on the agar, so the fact that we did not see the yellow-orange colonies that are typical of pathogenic Staphylococcus was also an indication that the colonies were not likely to be pathogenic.